151716, Flying Officer (Pilot), 39 Squadron. Royal Air Force Volunteer Reserve. Died 14 July 1944 aged 22. Buried in Belgrade War Cemetery. Son of Albert and Ethel Chandler of Lightfoots, Leigh, Kent. 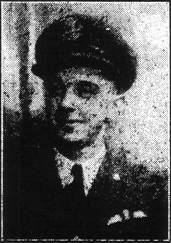 News has been received by Mr. and Mrs. A. Chandler, of Lightfoots, Leigh, that their eldest son, Flying Officer Leslie Albert Chandler, who was reported missing in Yugo-Slavia last July, must now be presumed to have lost his life. Twenty-two years of age, Flying Officer Chandler was educated at Penshurst and the Judd School. He joined the R.A.F. in 1940, serving on the ground staff until he re-mustered for aircrew duties in 1941. After training in Canada he gained his wings and commission in 1943, becoming a keen, enthusiastic pilot. F/O Chandler was a King’s Scout and before the war was apprenticed as a draughtsman to Messrs. Nickolls, Compressors, of Letchworth. 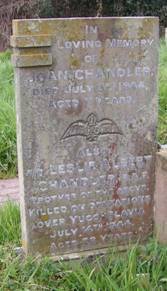 It was in July last that Mr. And Mrs. Chandler’s little daughter Joan was killed when a cannon-shell exploded at Leigh School and much sympathy is extended to them in their second bereavement. Their younger son Raymond is training to be a navigator with the R.A.F. Remembered on Leigh War Memorial and on his younger sister’s gravestone in St Mary’s graveyard, Leigh.